John Pilger made the following remarks in presenting the 15th Martha Gellhorn Prize to Robert Parry at a dinner in London on June 27. There are too many awards for journalism. Too many simply celebrate the status quo. The idea that journalists ought to challenge the status quo — what Orwell called Newspeak and Robert Parry calls “groupthink” — is becoming increasingly rare. 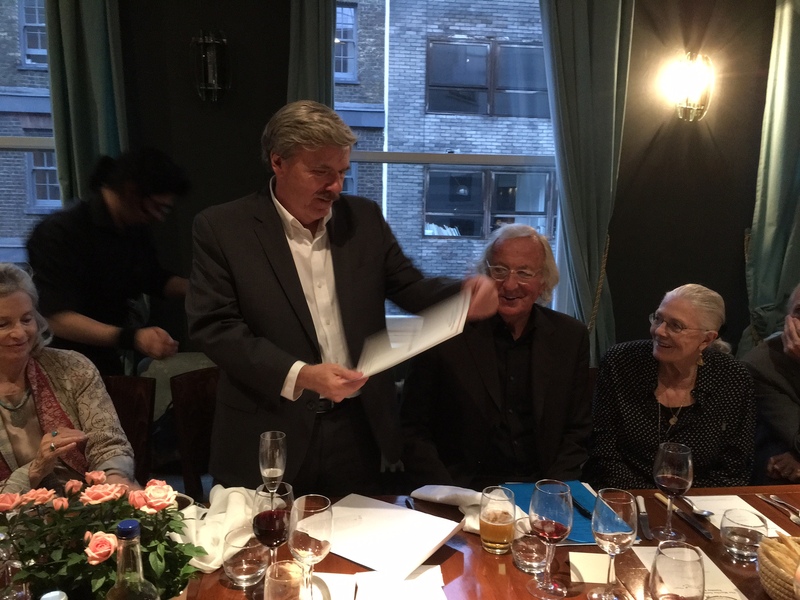 Robert Parry receiving the 2017 Martha Gellhorn Prize for Journalism in London on June 28, 2017. Also, from left to right, are Victoria Brittain, John Pilger and Vanessa Redgrave. More than a generation ago, a space opened up for a journalism that dissented from the groupthink and flourished briefly and often tenuously in the press and broadcasting. Today, that space has almost closed in the so-called mainstream media. The best journalists have become – often against their will – dissidents. 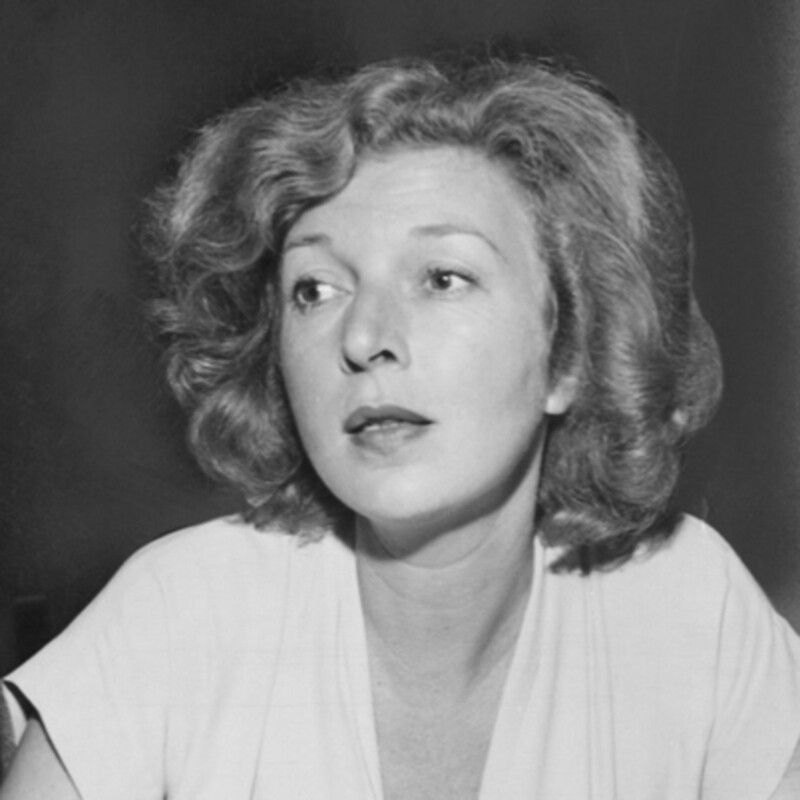 Martha was renowned as a war reporter. Her dispatches from Spain in the 1930s and D-Day in 1944 are classics. But she was more than that. As both a reporter and a committed humanitarian, she was a pioneer: one of the first in Vietnam to report what she called “a new kind of war against civilians”: a precursor to the wars of today. She was the reason I was sent to Vietnam as a reporter. My editor had spread across his desk her articles that had run in the Guardian and the St. Louis Post-Dispatch. A headline read, “Targeting the people.” For that series, she was placed on a blacklist by the U.S. military and never allowed to return to South Vietnam. When, in 1990, President George Bush Senior invaded Panama on the pretext of nabbing his old CIA buddy General Noriega, the embedded media made almost no mention of civilian suffering. My phone rang. “I smell a rat,” said a familiar voice. Imagine that question being asked today. And that is what we are honoring this evening. Truth-telling, and the courage to find out, to ask the forbidden question. Robert Parry is a very distinguished honorable exception. Bob Parry’s career has been devoted to finding out, lifting rocks – and supporting others who do the same. 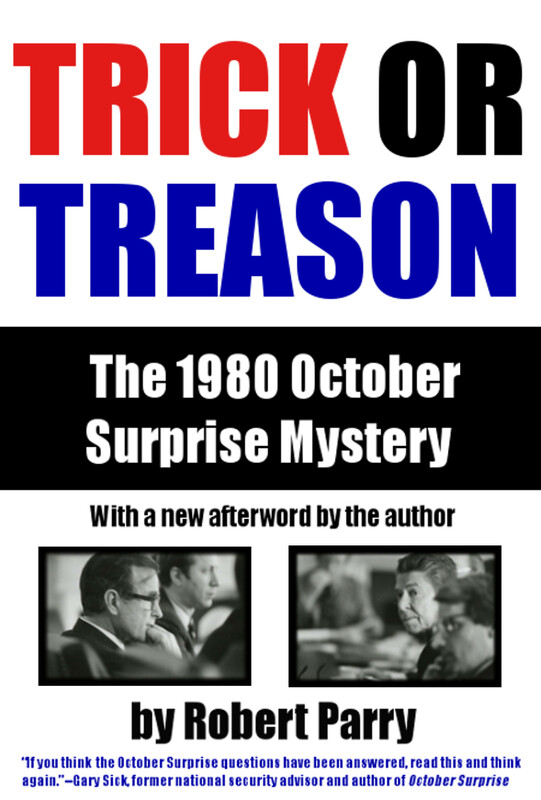 In the 1990s, he supported Gary Webb, who revealed that the Reagan administration had allowed the Contras to traffic cocaine in the U.S. For this, Webb was crucified by the so-called mainstream media, and took his own life. Lifting the big rocks can be as dangerous as a warzone. For his journalism, Robert Parry is the winner of the 2017 Martha Gellhorn Prize. He joins the likes of Robert Fisk, Iona Craig, Patrick Cockburn, Mohammed Omer, Dahr Jamail, Marie Colvin, Julian Assange, Gareth Porter and other honorable exceptions. I just wanted to congratulate you on this very prestigious award. She was one of the best and so are you. 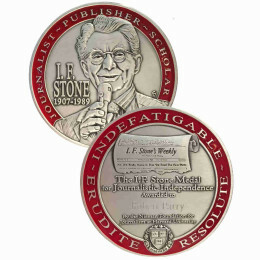 well deserved congratulation Mr.Parry and keep up the amazing muckraking and mythbusting! It’s unclear what he won the prize for. Your journalism is shoddy. Michel Could you give some examples of Mr. Parry’s shoddy work? Congratulations, Mr. Parry. Deep respects for who you are and what you do. Gratitude for giving us this excellent site. Congratulations, Mr.Parry! World knows you deserve it. Thank you for honest and hard job you do. Best wishes. John Pilger is one of ours, Australian grown & he has done us proud. “The idea that journalists ought to challenge the status quo …. is becoming increasingly rare.” says John Pilger. “a space opened up for a journalism that dissented from the groupthink & flourished briefly …. Today that space has almost closed in so-called mainstream.” says John Pilger. Alas John – it was an oversight on the part of the establishment – they took their eye off the ball – or it was an attempted shot across the bough of the powers that be for a wager rise – & not because it was – even a trial run for ratings. There is no place in mainstream media for anything less than blind obedience – that any of you “quirky” journo’s made it was a miracle. Thank you Mr Parry for providing us with trustworthy news. Congratulations for winning the Martha Gellhorn Prize. 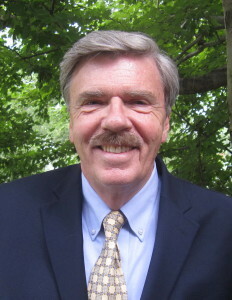 I couldn’t be more delighted than to hear Robert Parry has won the Gellhorn Prize. Richly deserved. Democracy absolutely depends on transparency and accountability. Without investigative reporters with guts and integrity we see these values slip away. Wow–a prize handed out by one exceptional journalist to another! This is incredibly great news that happens so rarely nowadays. Congratulations! Ever since since he put the “October Surprise” and the eclipsing of his mainstream career behind him and focused on contemporary events, his work has been consistently out of the ballpark. What would we do without him? Izzy Stone was my opening to the world and political reality when I was a mere schoolboy……. Congratulations, Robert! Well done and well deserved. Congratulations.. Consortium with you, Robert Parry, as the editor and writer and the other writers that appear makes it a must read each day, and the readers you have attracted and their comments makes the site even more worthy. All of us hope will expand and turn on the lights where there is only darkness. Congratulations, Robert. Very well deserved indeed. Keep on speaking truth to power. so-o-o-o, a meal, wizard-of-oz proclamation, and a clap on the back ? ? ? no grant, stipend, pension, sinecure, gold-tone casio watch, or amazon gift card ? ? ? great that an intrepid and deserved reporter is recognized by his VERY FEW peers, but if the korporate media doesn’t bullhorn it, did it really happen ? ? ? Congratulations for a fine man upholding a fine tradition. “What can I say? The man is a legend! K.D. Land speaking of Roy Orbison. What can I say Mr Parry? Good onya Mate!! Should have closed with” after legend! Thanks for giving us real news. It’s great to see you get the recognition you deserve. I’m continually impressed by the quality of writing I see here. I consider Consortium News, and your reporting in particular, to be esssential daily reading. Consortium News is a marvel. I thank you, Mr Parry. Many, many thanks for your pursuit of truth in an age of incredible dishonesty, Mr. Parry. Congratulations and a toast to your invaluable work. May Consortium News replace Washington Post in readership followers! As one of your many readers I wholeheartedly agree with their choice! Congratulations, Mr. Parry for receiving this well-deserved and prestigious award. You have been my top go-to journalist for truth for quite some time now and reading your articles and others on CN is the most hopeful element in my life. I recommend this site to everyone I meet. You are such a light, Mr. Parry. Congratulations. I remember the first time I read one of your articles. I thought to myself: “What? This guy is actually telling the truth. Who is this man who speaks the truth? Is this man for real?” I couldn’t believe my eyes because the truth was actually staring back at me. It was purely by accident that I stumbled onto your site, but it felt like home. Truth, such a rare commodity. Thank you, Robert Parry. Thank you for your bravery and honesty. Keep working and inspiring people. My congratulations too, and also thank the very many people who comment so effectively on this site. Congratulations, Mr. Parry. What gladsome news! Thank you so much for providing in-depth coverage of today’s so important issues. God bless you mightily. Thank you, Robert Parry, for your indefatigable work of independent investigative journalism in the face of a new kind of war against journalism. Official drivel has shifted into overdrive, now disseminated by fake “citizen investigative journalists” and bogus “online investigators”, in collusion with a burgeoning “First Draft” propaganda coalition. Yes! Congratulations, Robert Parry. I hope the Martha Gellhorn Prize organization can help publicize CN and bring in additional readers. Thanks for having the courage to tell the truth Robert Parry. The truth is the only thing that can save us now. Whether enough of us will own up to the truth is the crucial question that hangs over us now. Congratulations, Mr. Parry. Receiving this award from John Pilger is an honor in itself . This is well deserved. Congratulations and thanks for your work-much needed sunlight on the rot in the Wash DC regime! Congratulations Robert Parry & thank you for your truth telling & reporting. In a world that doesn’t make much sense at all, you and a few others are keeping us in the light and give us hope that some day a greater truth will prevail and the result of that will be a better world. Congratulations! You truly deserve this award. I’ve been a long-time follower of Consortiumnews and I cannot thank you enough of your great work. The world needs honest and brave journalists like you maybe more than ever before. Thank you and everyone contributing to Consortiumnews. Congratulations Robert Parry; you richly deserve this! Congratulations Mr. Parry. You are very deserving of this award. Your website has become my favorite for real news and thoughtful opinion. Thank you for all your hard work. Meanwhile Col. Lawrence B. Wilkerson, former chief of staff to Colin Powell, has just confirmed by email that Seymour Hersh’s investigation of the alleged Syrian sarin gas attack 4/4/17 with the scenario of what was behind Trump’s subsequent bombing of Syria with 59 Tomahawk missiles 2 days later (4/6/17)…is true (“Trump’s Red Line”, published in Die Welt 7/25/17): indeed, what Wilkerson had concluded himself weeks weeks before.. I’ve known Wilkerson for almost 7 years…since he served as the keynote speaker for our UNC Cuba symposium in Chapel Hill, NC Sept. 2008. Thanks to Parry, Ray McGovern’s summary of Hersh’s investigation (with link to the complete article) was published here at CN 6/25/17 as “Intel Behind Trump’s Syria Attack Questioned”, in case anyone missed this stunning revelation. British journalist Jonathan Cook received a Martha Gellhorn Special Award for Journalism in 2011 for his work on the Middle East. Congratulations to Robert Parry. The Iran/Contra abomination was indeed much worse than Watergate. It was a heinous crime against the people of Nicaragua from which they have still not recovered. It makes all the talk of Russian “meddling” in our “democracy” all the more absurd. Congratulations Mr. Parry! Well deserved. Yours is one of the few news websites where truth can be found. Thanks.